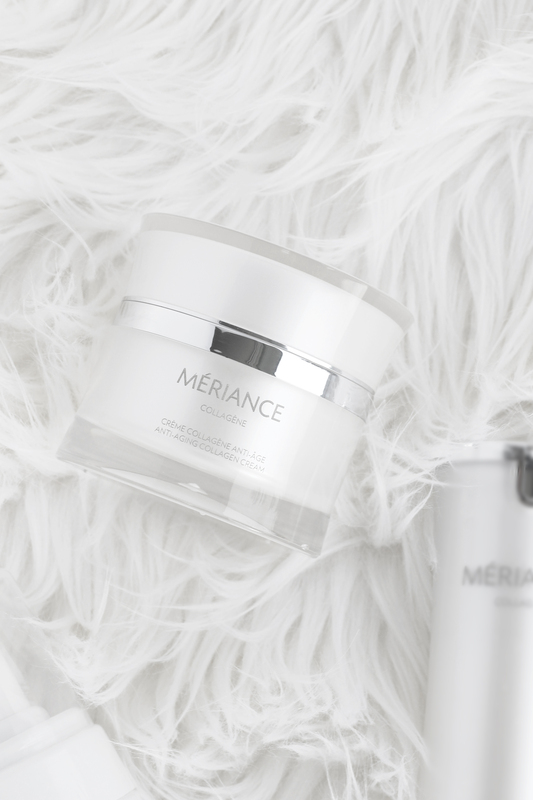 I recently was sent products from the Mériance Collagéne skin care line and I was curious to see if higher end skin care was worth the cost. If you have been following me for a while, you may know that I’ve been battling hormonal acne. I’ve also noticed some early signs of aging recently too, fine lines, textured skin and uneven skin tone! I speak very openly about my problematic skin, especially on my Instagram stories. If you follow me there, you have literally seen my skin at its worst as I rarely wear makeup! So I was eager, yet sceptical, to see if these products would give me any results. 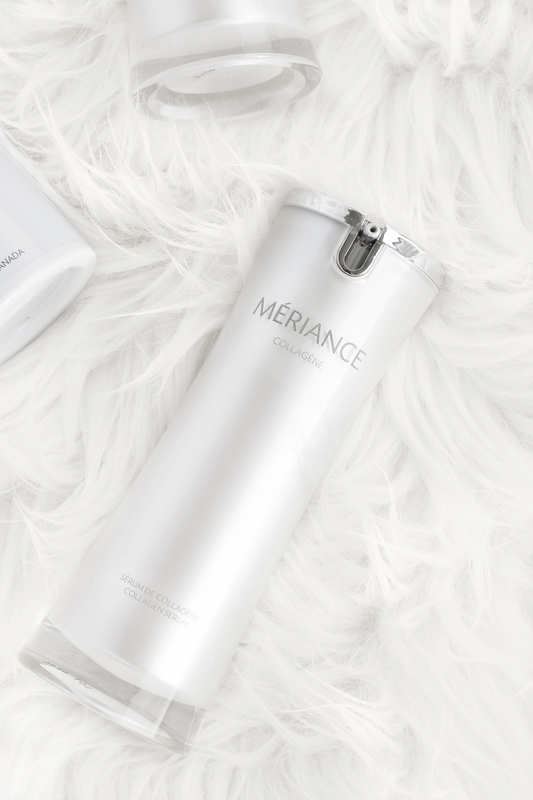 This high-end line of skin care products made in Quebec, Mériance Collagéne is synonymous with luxury. Applying Mériance treatments to your skin provides a moment of pure pleasure, with guaranteed results. 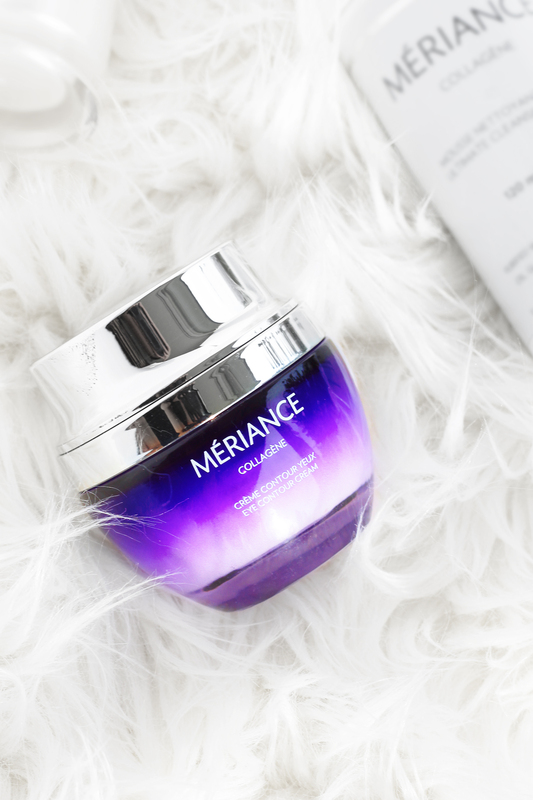 Mériance redefines the notion of cosmetics with its offering of the highest number and highest concentration of anti-aging molecules in each bottle. 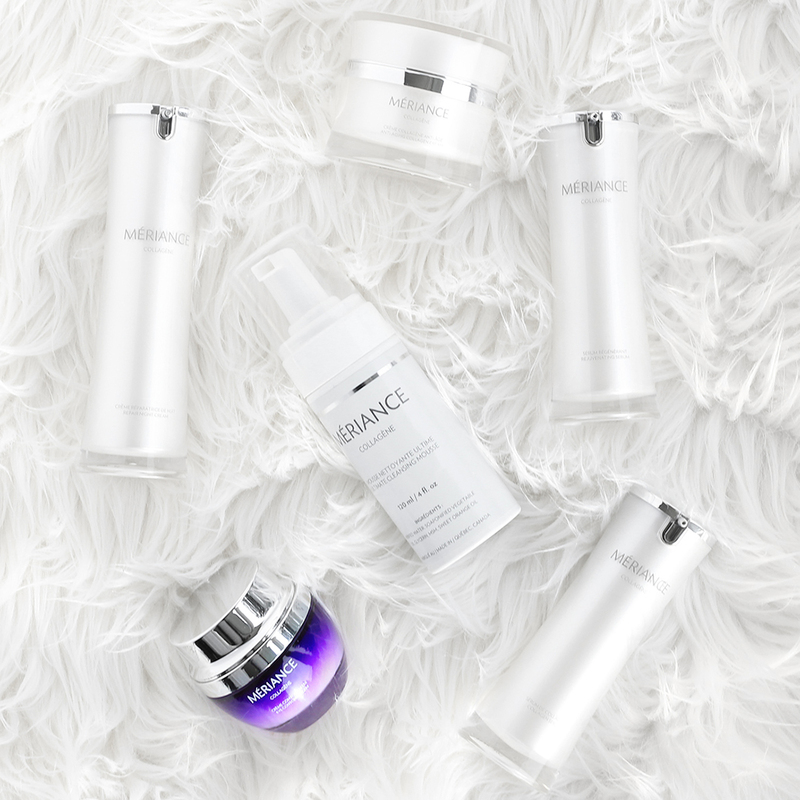 With record levels of active anti-aging ingredients, Mériance goes beyond industry standards while adhering to structural formulas under dermatological control. 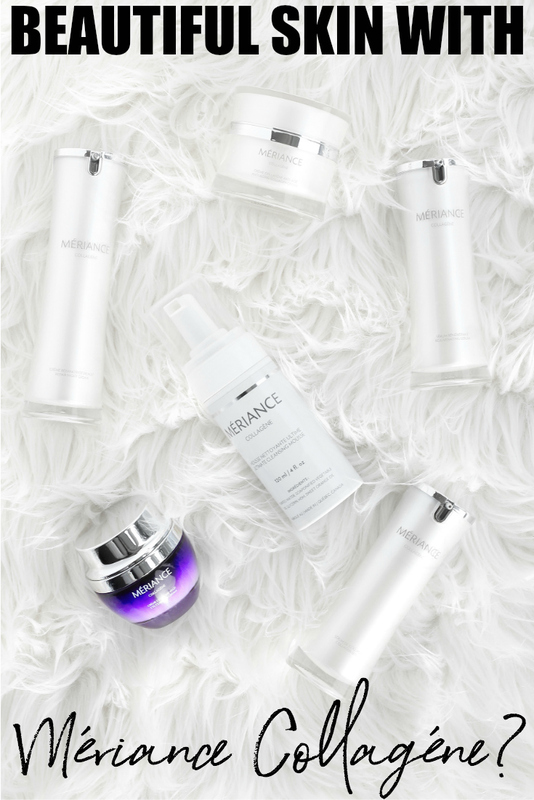 The Mériance range refuses to compromise in any of its products, which are all manufactured from noble and natural ingredients! The harsh winter weather always does a number on my skin and often my hormonal acne is worse in the winter months. Being that I am 36 years old, I am also noticing the signs of aging, seriously, where is the fountain of youth when you need it! I was hopeful to see an improvement in my fine lines, textured skin, uneven skin tone and maybe even the hormonal acne. One of the things I struggle most with is consistency, but I know to see results (if there will be any) you have to be consistent. 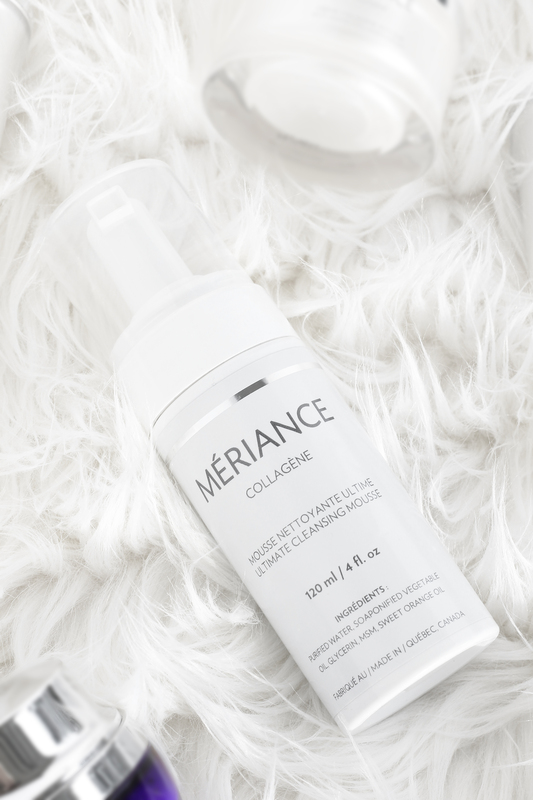 I am proud to say that I have used the Mériance Collagéne products religiously for the last two and a half months daily, and still going strong! This deep cleansing mousse prepares the skin and is designed to hydrate, protect and improve the general look of your skin. It is made with sweet orange essential oil and seriously smells amazing if smell matters to you. I use this cleansing mousse in the morning and night to wash my face before applying any of my serums and creams. 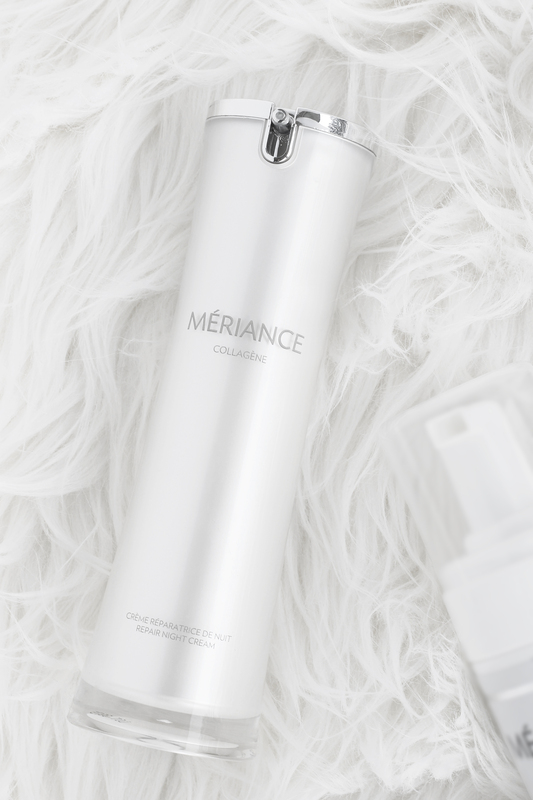 2-3 times per week I use a light exfoliating scrub I received from my plastic surgeon’s office before washing my face with the Mériance Collagéne Ultimate Cleansing Mousse. It leaves my skin feeling clean and fresh without drying it out like other products I’ve used. 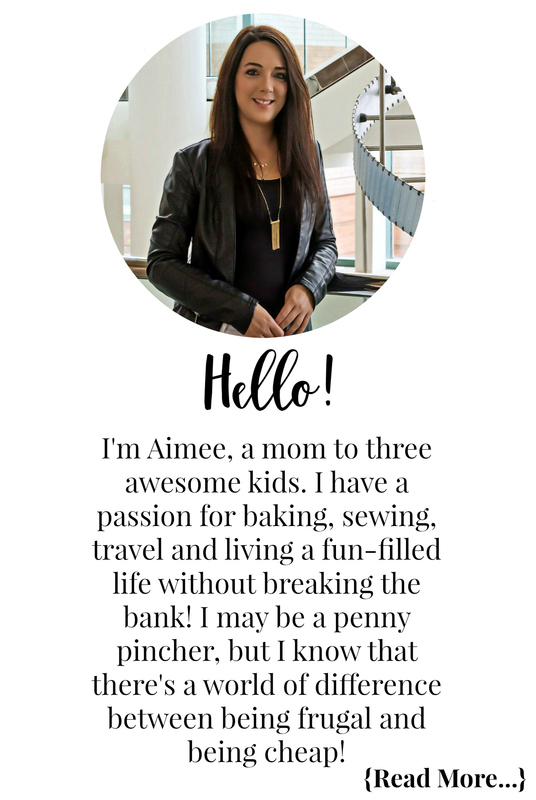 While this product isn’t included in the kit, it is definitely a must-have! 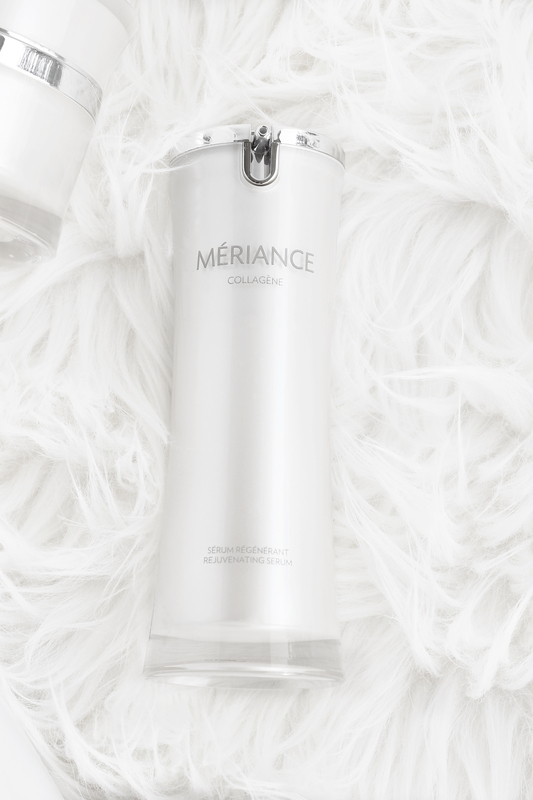 Step 2 in my skincare routine is the Mériance Collagéne Rejuvenating Serum. This serum helps to encourage the release of collagen within your skin using fibroblast skin cells. Its active ingredients, Peptides & Hyaluronic Acid, react quicker and more effectively for immediate results. This serum prepares your skin cells to receive the Native Collagen Serum which is step 3 in my skincare routine! I’ve noticed my skin has become brighter and more radiant since using this product. Ou cell turnover also slows down and our collagen production decreases. Worst of all, our supporting tissue gets disorganized. This leads to a slackening of the skin and the appearance of increasingly deep wrinkles. Thankfully I am not there yet, I do have some fine lines so I want to prevent them from worsening for as long as I can! This collagen serum targets cellular dynamism to reinforce the dermis architecture and fight the signs of aging. 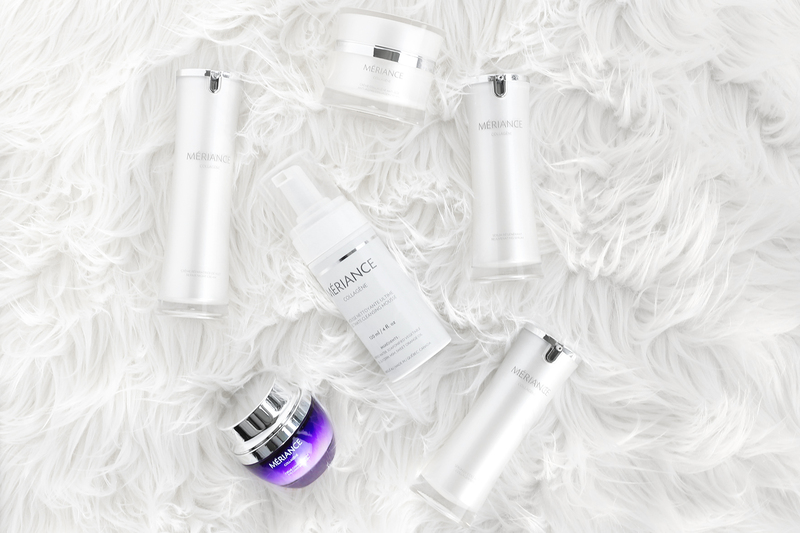 Native Marine Collagen is the most beneficial ingredient to delay the formation of wrinkles and aging signs. Results are noticeable from the first application, which I can attest to as my fine lines definitely smoothen out after applying this! This Anti-Aging Collagen Cream stimulates the fibroblast biomechanical functions allowing it to reorganize the dermis architecture. Skin density and firmness are rapidly enhanced, leading to a reduction in skin roughness. The combination of the soluble form of Mériance Bioactive Collagen and the Spilanthes Acmella Extract strengthens tissue elasticity and improves the skin’s ability to absorb and maintain moisture. Its action on the supporting tissue rapidly reorganizes collagen fibers and visibly smoothes the skin. If there is one thing that bothers me more than my hormonal acne, it is my textured skin. Having extremely large pores and very textured skin, my makeup I would use to cover my acne scars would only highlight my pores and skin texture. So if it wasn’t one issue, it was another! If nothing else, this skincare line has seriously improved my skins texture and my pores are virtually undetectable. If there is anywhere I notice the fine lines starting more, it is in my eye area. I naturally have puffy under eyes, mom life and lack of sleep will do that to you! Since implementing this eye cream into my skincare routine I have noticed a significant reduction in puffiness. It’s so hydrating and I think that is the key to less puffy eyes and fine lines. I’ve also noticed an improvement on how my under eye makeup looks. My under eye makeup would fall into all my fine lines making it look awful. Now that my skin is hydrated, those fine lines are smoothed out and my makeup looks great! The Mériance Collagéne Repair Night Cream is the final step in my skincare routine. This cream is both nourishing and restorative. It is rich in soluble native collagen and antioxidants, enhancing the natural regeneration mechanisms of your skin while you sleep in order to help restore the natural beauty of your face and neck. I usually dislike night creams because they are thick, leave me oily and cause breakouts, but this was different. It absorbed into my skin with ease and I didn’t wake up oily. Maybe it was the antioxidants, maybe it was the collagen? I’m not sure what it was, but my face and neck have never felt more hydrated! Over the last 2 months of using Mériance in conjunction with my exfoliating scrub, I have noticed a significant change in the occurrence of my hormonal acne. It’s virtually gone, other than a random pimple every now and again. You have no idea how long I have been fighting this hormonal acne battle. I honestly thought it was a lost cause and I would just have to deal with it for the rest of my life! While I still have the scars that my hormonal acne left behind, those are easily concealed with makeup, where the large and very painful acne was not. I’m a firm believer in results, and being able to wake up every day without a chin full of painful acne or horribly textured skin is a positive result in my books! 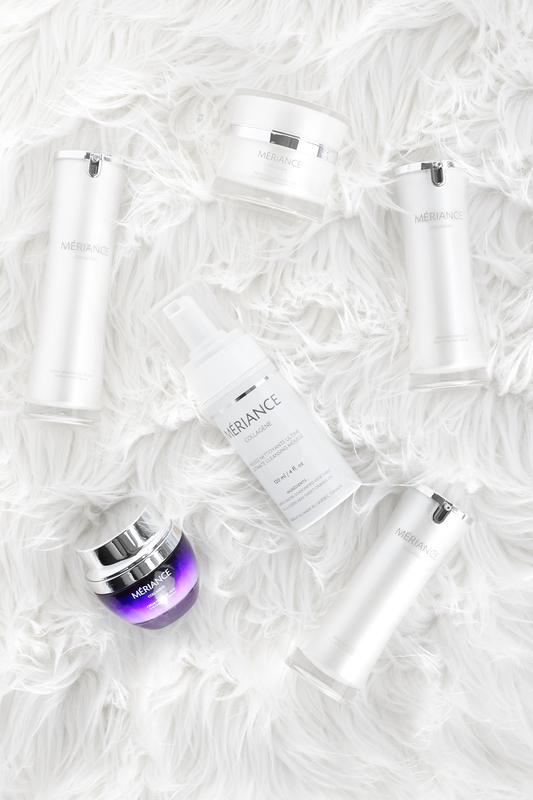 Mériance has graciously offered me an exclusive discount code to share with my readers to save $50 off of their purchase! Use coupon code ExtremeCouponing50 at checkout to save $50 off your order of $50 or more. The coupon code expires December 31, 2018. Enter to win a $75 Mériance gift card code! The gift card code can be used on any online purchase of $75 or more. It is not reusable, one-time use only, and expires on December 31, 2018. Contest ends on December 7, 2018 at 11:59pm EST. The winner will be contacted via the email used in the comment box and will have 24 hours to respond to claim their prize! To enter, simply leave a comment below on this blog post (scroll down for the comment box) telling me what your biggest skincare issue is. Disclosure: Although I was sent product for review consideration, the opinions and language are all my own, and in no way do they reflect Mériance. Any product claim, statistic, quote or other representation about a product or service should be verified with the manufacturer, company, provider or party in question. « Give The Gift Of Surprise With L.O.L. Surprise! Dryness is one of my biggest skin care concerns. Thank you for the giveaway. My biggest skin care issue is oily t-zone but flaky dry in other areas. I’m hard on myself but I have lines on my forehead , around my eyes and laugh lines. I also blame my kids lol. I feel like our skin is very similar. Right now I am struggling with hormonal acne, dry uneven textured skin. Large pours. I cannot wear make up without looking like a cake face. Would love to find something that works for my skin. My biggest skincare issue is sensitivity and redness. Which is GREAT when it’s -35 C outside, let me tell you. my biggest issue is = fine lines. My biggest skincare issue is oily pore-y skin. Dry skin is my main issue. Thanks! This would be great. My biggest concern is my pores. They’re very visible. Also dry skin. Thank you! My biggest concern is dull and aging skin. Sensitivity and redness are my main issues. My biggest skin concern is signs of aging like wrinkles, dullness, etc. I would love to try this!! Thank you for the chance to win! My biggest skin care concern is dry skin and hyperpigmentation. Since having my third child last December my skin has never been the same. I have mild rosacea, oily skin and dark circles! To name a few. I have not been able to find a skin care regimen that works well fory skin!